Although it’s all mostly inconsequential, seeing as how I don’t have any way to directly impact the team’s decisions (aside from my many, very real and very effective superstitions, of course), I still struggle to get a good grasp of what I think the Cubs’ 2018 season was. At MLB.com, Richard Justice fights against any perception out there that it was some sort of disaster. 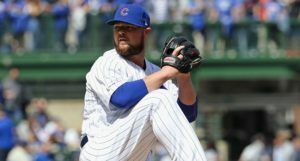 He hits on all the usual beats – the Cubs were without key players for long stretches, still had a great bullpen, great offense in the first half, still won 95 games, which was the second most in the NL, etc. – and he’s right about all of it … and I don’t have a “but.” Like, if Kris Bryant, Yu Darvish, and Brandon Morrow are healthy next season, are we really that concerned about the team? 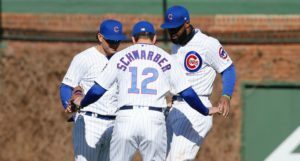 There may still be some needs, sure, and they’ll have to do something to fill in the gaps, but I get his point: the Cubs do not need some massive overhaul. But where I diverge from Justice a bit is that I still think they should still be quite active this offseason. 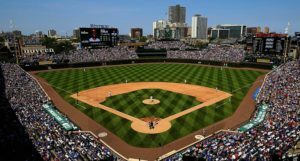 The Cubs, with their competitive window full of prime-age players heading towards free agency faster than I think any of us are prepared to admit, need to push every single chip into the middle of the table despite the fact that they’ll probably be good enough to compete next season anyway. For what it’s worth, Justice believes Cole Hamels will be their “only big-ticket move” this winter, but suggests they could trade for someone like Minnesota’s Robbie Grossman or Tampa Bay’s Tommy Pham. At Sports Illustrated, a team of analysts/writers all took their guess at where Bryce Harper will eventually sign and for how much money. Of the six guesses, the Nationals, Yankees, and Astros all got a nod and the Phillies took the remaining three. In terms of the final deal, Sports Illustrated goes as low as 8 years and as high as 10 years with an AAV as low as $31.5M and as high as $37.5M. So, yeah, as you can see there’s still not a ton of clarity. For what it’s worth, I think it would be unwise to exclude the Cubs, White Sox, and Dodgers from this discussion, even if their interest isn’t readily apparent, and I still think the Yankees are focused on Machado, but I suppose we’ll see. If one thing remains crystal clear, it’s the Phillies as the frontrunner in the rumoring minds of all. Everyone is calling it for them, so keep that in mind as we get to the next bit here from Joel Sherman … maybe the Phillies shouldn’t splurge on Harper. In Sherman’s estimation, the Phillies could do more for their team with the $300M+ they intend to spend on Harper by spreading it around. For example, they could use that money to get Patrick Corbin, Craig Kimbrel, Michael Brantley and Josh Donaldson (Sherman’s idea), and surely – in his view – that would be better for a roster as incomplete as theirs than a finishing touch/luxury piece like Harper. I see where he’s coming from, but I suspect that’ll be a tough sell. My guess is the Phillies try to get Harper and one more big-ish piece anyway, and maybe that’s enough. The Nationals are still somewhat tough, the Braves are exploding and the Mets are under new management. An impending Phillies reign is not preordained. Speaking of the Mets, owner Jeff Wilpon says an extension for Jacob deGrom is not the Mets top priority right now. “We’ll talk with the new agent here at some point in the near future, probably see him at the Winter Meetings.” Now, deGrom needs a new agent, of course, because his old agent, Brodie Van Wagenen, the one who said the Mets should either extend deGrom or trade him, is now running the team. Or, well, you know, running it behind owner Jeff Wilpon, who has always been very involved. This sort of owner over-involvement is exactly why the Mets struggled to attract some top front office talent in the first place, by the way. Hey, it’s his team and he can do what he wants, but sometimes you gotta just let the baseball ops people do the baseball ops’ing. If you’re still hot on the idea of adding Marwin Gonzalez, you should note that the Astros just acquired infielder Aledmys Diaz, potentially as insurance for Gonzalez departing. Maybe they don’t think they’ll be able to re-sign him? Nathan Eovaldi is drawing some serious interest, including, apparently, the Brewers, Angels, Phillies, Braves, Blue Jays, Padres, White Sox, Giants, and Red Sox. Though the Yankees and other mystery teams are likely to be involved, as well. You can read more about Eovaldi’s market right here. Brett mused on the similarities to the Tyler Chatwood pursuit last year. If the Nationals decide not to up their offer to Bryce Harper and let him sign elsewhere, Nick Cafardo suggests they may use some of that money to sign someone like Dallas Keuchel or trade for a catcher like J.T. Realmuto. The logic tracks as the Nationals will certainly be looking for starting pitching help and have been hot on adding a catcher via trade for a while now, but early rumors suggested the Marlins did not want to trade Realmuto to someone in the NL East, which, given his age and talent, is understandable. Cafardo has more on Andrew Miller and Bryce Harper, including his gut telling him the “where” of the decision might end up matter more than people are expecting. Is Philadelphia really where he wants to be for the next 10-14 years? I don’t know what the Reds will be next season – heck, I don’t know what they’ve been up to the last four seasons – but if they’re hoping to be competitive, they’ll have to make some serious moves. Jonah Keri offers up some potential ideas, but points out that a shoestring budget and reluctance to part with top prospects might limit their options. Frankly, with Joey Votto at 35 but still swinging, the Reds should probably look to tear everything down. If I were them, I would trade everybody whose anybody and hope that their next ramp up coincides with the Cubs/Brewers wind down. But I doubt it. If they haven’t traded Votto by now, they probably never will. Maybe their young guys in the minors actually break through in the next two years, and they surprise. And finally, although this free agent class was always the one people were excited over, next year’s class also looks pretty darn exciting … perhaps even more so, when you consider how much this year’s class wound up falling off? Will Leitch doesn’t rank next year’s class, but he does share some key free agents exiting every team after this season and the names are enticing: Chris Sale, Xander Bogaerts, J.D. 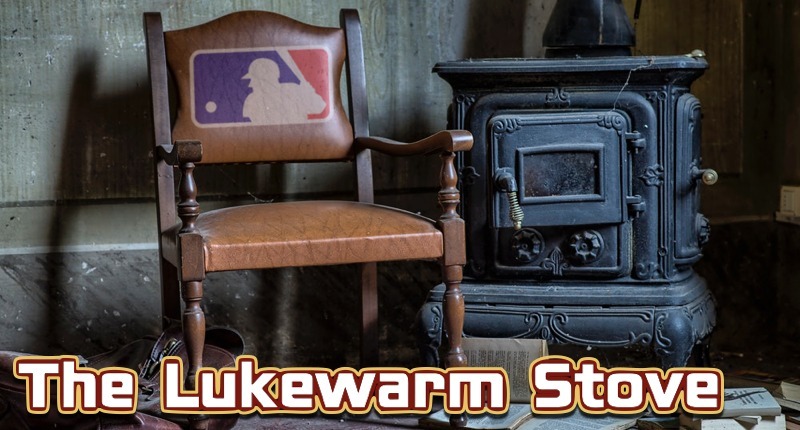 Martinez (opt-out), Jason Kipnis, Corey Kluber (option), Jose Abreu, Gerrit Cole, Anthony Rendon, Madison Bumgarner, Marcell Ozuna, Scooter Gennett, Paul Goldschmidt, Yasiel Puig, Nolan Arenado, etc. The class might not have the 26-year-old star duo of Harper or Machado, but damn … there’s some beef there.